This is why we decided to provide you with our little project of fast and efficient unit converter. 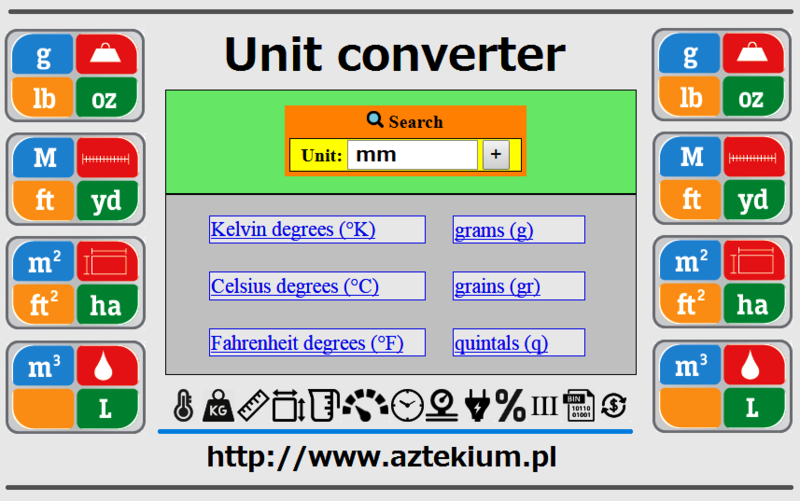 Just visit the site http://aztekium.pl/units, it provides you with an online conversion calculator for all types of measurement units. You can find metric conversion tables for SI units, as well as English units, currency, and other data. Type in the unit symbols, abbreviations, or full names for units of length, area, mass, pressure, and other types. Examples include mm, inch, 70 kg, 150 lbs, US fluid ounce, 6'3", 10 stone 4, cubic cm, meters squared, grams, moles, feet per second, and many more! The online converter which we offer to you is going to allow you to efficiently change a target unit into another. Have you for example ever wondered how much is one petabyte? Well, thanks to our converter you are going to be able, to easily check how much is it by converting the unit to megabytes, gigabytes or terabytes. Really practical, don't you think? The question which you might to ask is why you should decide to use our converter. Well the answer on this question is very easy. Thanks to our little converter you will be able to change any type of unit into other within a span of few seconds. Imagine now, that you have to prepare a project or a translation of a technical document from English language to Polish language. As far as you might know, both Poland and England use different measurement units. Hence you will be forced to convert the units in order to make the text understandable to a native speaker from a target country. Even if you are really great mathematician in might be a hard task for you. This is why we created our little converter. It is going to help you with your converting problems.